Photo of a statue with a broken nose, with some people passing by indifferently in the background. 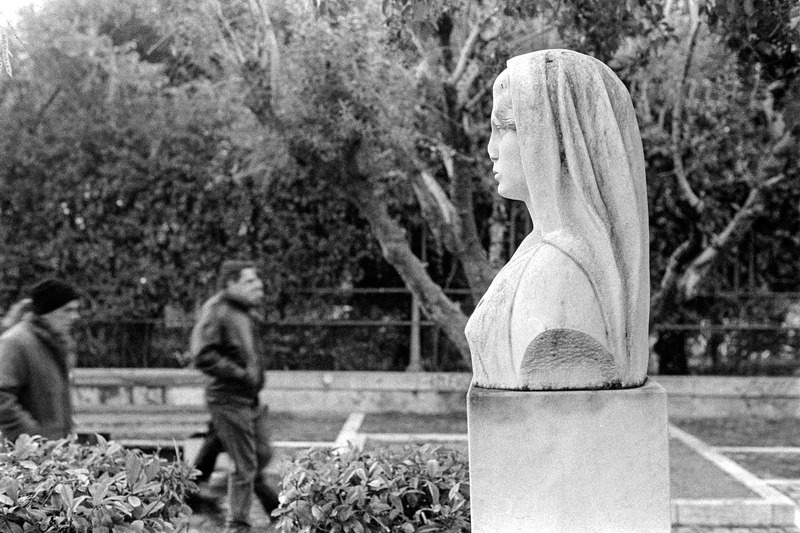 I don’t remember which woman this broken statue depicts, but I certainly know where I took the photo; in the walkway between the University and the Academy in Athens. Although I have walked many times this street, I haven’t really paid attention (after the first few times at least) to the statues being there and that is one reason why I don’t remember the person depicted. I also don’t remember the broken nose drawing my attention before, although I had seen it countless times, until the day I took this photo. Once I took notice of this abnormality and decided to use it as a theme for a photo, I had to find an interesting point of view to make the photo. Taking the photo straight ahead would not make the element that would be the actual subject noticeable so it was immediately ruled out. Since quite a few people were passing by, I decided to move to the side of the statue, where the missing nose would be evident, and also include some of the people walking to wherever they had to go. The shallow depth of field would ensure that the actual human figures wouldn’t distract the attention of the viewer from the broken statue but they would become just an element of the composition. With all these thoughts, I moved to make the photo which I present today.